The SE GP3-SS30DT Prospector's Choice 12" Serrated Carbon Steel Edge Digger Garden Tool is made of heat treated carbon steel, which allows this tool with straight and serrated edges to easily break through roots, hard soils, and concrete. The oversized comfortable grip and hand guard helps in minimizing accidental injuries. Our edge digger also comes with a sheath to keep the tool with you at all times by looping the sheath to your belt. Our multipurpose serrated edge digger is useful for a variety of tasks including digging, weeding, loosening soil, planting, transplanting, excavating treasures, cutting clean and deep plugs, and more. This 12" serrated edge digger is the prospector's choice to search, find, and collect. 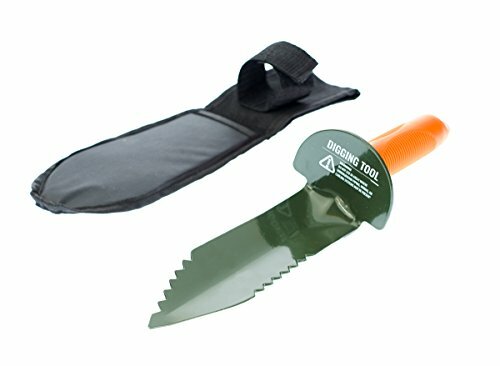 It is a multipurpose tool for a variety of gardening tasks. The length of the shovel is 7-1/2". The overall length is 12". SE is committed to providing the customer with the best source for value possible on the market. You will enjoy the quality, function and usefulness of our SE GP3-SS30DT Prospector's Choice 12" Serrated Carbon Steel Edge Digger Garden Tool.